The summer is upon us, wardrobes are thinner and clubs are sweatier. This was too true at The Showbox on this early July evening, as the traveling caravan of Murder By Death, Tiger Army and Tim Barry brought a damn good night of music to the Emerald City. Tim Barry got things off to a nice start serenading the audience with songs written in roadside motels, while on the road as a trucker. His deep voice helped drive the poignancy of the lyrics home. His stage presence and charisma kept the audience engaged and entertained. The soulful sons of Psychobilly stormed the stage next, whipping the audience into a frenzy with bass lines deep enough to rattle your chest and drum beats poised to hypnotize. Throw in Nick 13’s haunting vocals and it’s easy to see why this band has been around for over 20 years. 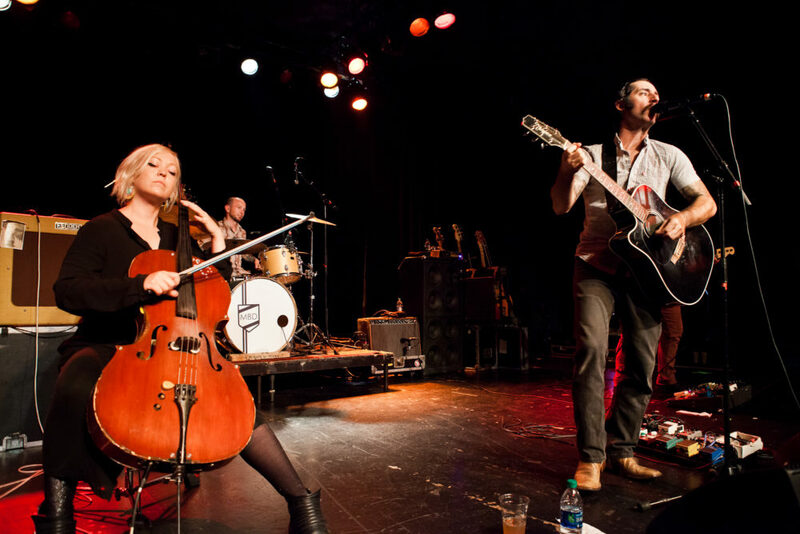 Murder By Death is a sight and sound to behold, defying genre and paving their own path. This was one full display during their Seattle stop as they ripped through an amazing set of dance-able, yet somber songs. Their performance was captivating and so powerful that Sarah Balliet broke a cello string. Which allowed lead singer Adam Turla a chance to entertain the audience with a song he wrote about hoping to not injure himself with a table saw.